I'm Andrea and this is my wife Laura. We have a six years old daughter: Giulia. We started to produce Organic Saffron in the "Valli del Natisone" (North-east Italy) in 2016. I'm an agronomist, and in my "past life" I worked as Production Manager in a food company. My wife was a chemist. Now she's a part-time teacher and works with me in our company. We decided to start-up this company for many reasons, above all for changing our lifestyle and begin to work in the nature. I've lived in Sardinia for almost 30 years and since I moved here in Friuli Venezia Giulia, (North-East Italy), I've always had the idea to cultivate a plant that was typically widespread in Sardinia: the Saffron. I wanted to base my company in a really pure environment, and we decided to search our fields in Valli del Natisone, native land of my wife's mother. We chose this place also because this territory is really rich in old Traditions and dramatically in need of a new economic and social development. 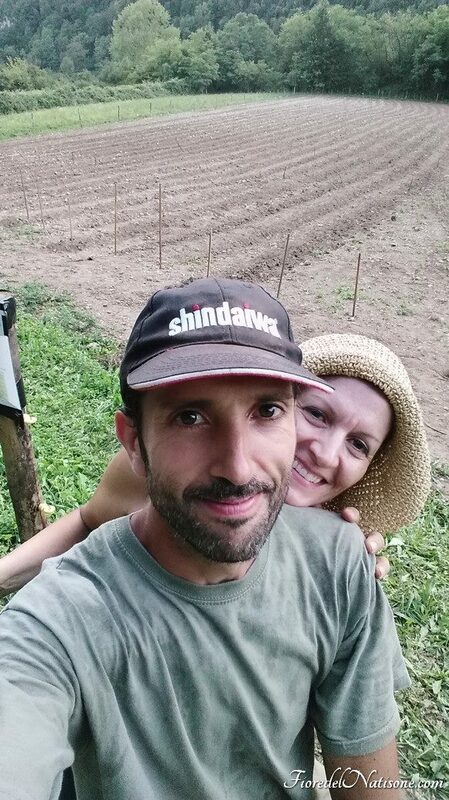 In 2016 we started a pilot cultivation in Pulfero village, where now company has its own headquarter, and in 2017 we started the main cultivation in San Pietro al Natisone, in an area mitigated by the constant flow of the Natisone river and in the middle of forest and hedge typical of the these places. -The production in the pure environment of Valli del Natisone. -Organic Product of absolute purity, made only with the sun, the soil, the rain and the hands of those who work here. - The product processing, completely manual in all its phases. The 6-petal rosette, also known as the Flower of Life, is a solar symbol, and is one of the drawings used in the “Valli del Natisone” as a well-wishing symbol against negative influences. The Natisone river is still pure, and as water, is a symbol of life and new flowing energy. The Saffron flower, so precious and delicate, grows in our company fields located in the “Valli del Natisone” in a pure environment, where tradition and respect for the land is still an essential value.